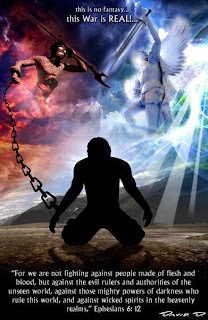 Spiritual Warfare and Casting out Demons? These issues keep coming up in blogs, articles and it runs rampant in books (ie. Joyce Meyer). In order to distinguish false teaching from true teaching you must have a some knowledge from the scriptures to weed out the false teaching. Luke 4:1 Jesus, full of the Holy Spirit, returned from the Jordan and was led by the Spirit in the desert,where for forty days he was tempted by the devil. He ate nothing during those days, and at the end of them he was hungry. The devil said to him, "If you are the Son of God, tell this stone to become bread." Jesus answered, "It is written: 'Man does not live on bread alone.'" The devil led him up to a high place and showed him in an instant all the kingdoms of the world. And he said to him, "I will give you all their authority and splendor, for it has been given to me, and I can give it to anyone I want to.So if you worship me, it will all be yours." Jesus answered, "It is written: 'Worship the Lord your God and serve him only. 'Jesus answered, "It is written: 'Worship the Lord your God and serve him only.'" The devil led him to Jerusalem and had him stand on the highest point of the temple. "If you are the Son of God," he said, "throw yourself down from here. For it is written: "'He will command his angels concerning you to guard you carefully; they will lift you up in their hands, so that you will not strike your foot against a stone.'" Jesus answered, "It says: 'Do not put the Lord your God to the test. '"When the devil had finished all this tempting, he left him until an opportune time. First Satan tempts him with a physical need. Jesus answers with scripture. Then Satan tempts him with power. Jesus answers with scripture. Then Satan temps him with scripture and an opportunity to show off. Jesus answers with scripture. The third attempt is true (quoting Ps 91:11) but Jesus knew it wasn't the time to show off and that there was a different scripture that applied besides the one Satan quoted. 1. You have to know scripture well enough to know how to apply the knowledge. Wisdom only comes from God. Eph 6:11 Put on the full armor of God so that you can take your stand against the devil's schemes. For our struggle is not against flesh and blood, but against the rulers, against the authorities, against the powers of this dark world and against the spiritual forces of evil in the heavenly realms. Therefore put on the full armor of God, so that when the day of evil comes, you may be able to stand your ground, and after you have done everything, to stand. Stand firm then, with the belt of truth buckled around your waist, with the breastplate of righteousness in place, and with your feet fitted with the readiness that comes from the gospel of peace. In addition to all this, take up the shield of faith, with which you can extinguish all the flaming arrows of the evil one. Take the helmet of salvation and the sword of the Spirit, which is the word of God. And pray in the Spirit on all occasions with all kinds of prayers and requests. With this in mind, be alert and always keep on praying for all the saints. 2. We are to stand our ground and not slip back into old sin and into new sin. To keep this from happening we are given instructions. Seek Truth in the scriptures, live right, share the gospel, grow in faith, be assured of your salvation, and pray always for you and others. As for casting out demons if you notice when Jesus and his disciples cast out demons they did so in Jesus' name. You will also notice that most of the cases had a physical alliment associated with them (ie, violence and trashing, throwing self in fire, mute, deaf). Most of them says, "since birth". This is not to say that people who are handicap are demon possessed. Sometimes God show us glory through the handicap people in our lives and through them we get a very good glimpse of a child like heart. Luke 11: 24 "When an evil spirit comes out of a man, it goes through arid places seeking rest and does not find it. Then it says, 'I will return to the house I left.' When it arrives, it finds the house swept clean and put in order. Then it goes and takes seven other spirits more wicked than itself, and they go in and live there. And the final condition of that man is worse than the first." 3. There is a warning here. Unless the Holy Spirit is put in the place of the demon then you just made things worse. 4. These are your marching orders. Make disciples, baptize them, and teach them to obey. This is the will of God. This is how you are to battle Satan and demons. Matthew 7:21 "Not everyone who says to me, 'Lord, Lord,' will enter the kingdom of heaven, but only he who does the will of my Father who is in heaven. Many will say to me on that day, 'Lord, Lord, did we not prophesy in your name, and in your name drive out demons and perform many miracles?' Then I will tell them plainly, 'I never knew you. Away from me, you evildoers!' "Therefore everyone who hears these words of mine and puts them into practice is like a wise man who built his house on the rock.